This wonderful, six-day holiday to the South of France includes a guided tour of the stunning walled fortress-city of Carcassonne, visits to medieval papal enclave Avignon and the spectacular Pont du Gard, and a cruise along the tree-lined Canal du Midi. Tour Provence’s glorious rolling countryside, and perhaps join an optional excursion to coastal Collioure and Narbonne’s Chateau de l’Hospitalet to enjoy a regional-wine tasting. 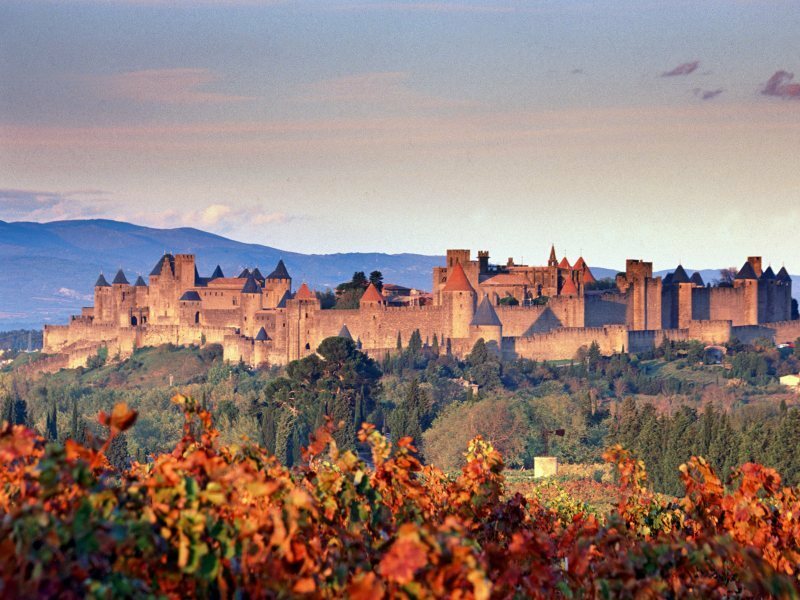 Fly to France, meet your Tour Manager and transfer to Carcassonne and your welcoming hotel. With accommodation reserved on a bed and breakfast basis, you’ll have the opportunity to dine out and sample the famous local cuisine during your stay. Today’s expertly guided tour of the medieval city of Carcassonne brings to life this extraordinary stronghold. After this fascinating introduction, you’re free to explore the citadel at your own pace. Restored in the mid-19th Century, the bastion includes the inner Chateau Comtal, the beautiful Church of St-Nazaire and many shops and restaurants. Continue your own exploration, today, or join our optional excursion to Collioure. This pretty port was once home to Matisse, and you’ll discover its curved bay and the palm-fringed promenade that runs along it beneath the protective gaze of the Chateau Royal. From Collioure we’ll continue to Narbonne, where an imposing 13th-century cathedral dominates the skyline of this former Roman capital of southern Gaul. After free time to explore, we’ll head to the Chateau de l’Hospitalet to enjoy a wine tasting and take in the spectacular Mediterranean views. The third of your included excursions takes you, first, to the astonishing UNESCO-listed Roman aqueduct, the Pont du Gard. Straddling the River Gard, its three levels of gradually increasing arches are one of the most striking masterpiece of Roman engineering in the world. You’ll then make the short journey to Avignon. Here, you’ll see the curious half-bridge of St-Benezet, the “Pont d’Avignon” of the famous French folk song, and the vast Palais des Papes, the 14th-century home of popes and cardinals. On our last full day we’ll enjoy an included cruise along a section of the tree-lined Canal du Midi, part of the 240-kilometre-long waterway constructed in the 17th Century to connect the Mediterranean to the Atlantic. Later, enjoy your last evening – perhaps dining in one of the atmospheric restaurants in Carcassonne’s extraordinary Cite. Say “au revoir” to Carcassonne, transfer to the airport and check in for your flight home at the end of a wonderful tour of the South of France.